If I could do it again, here’s what I’d do. I struggled with chronic acne for a decade before I found the holistic nutrition and skincare approach for clear skin. On my journey to heal my skin, I tried everything from prescription antibiotics to at-home acid peels. My advice to you now is, “Don’t try that at home.” Those pricey options do more harm than good, and don’t address the underlying cause of acne. My goal at Empowered Sustenance is to share my healing journey so I can save you the trial-and-error I went through. When it came to healing acne naturally, I had to find the answers myself. I learned the root causes of problem skin, and tested countless (at least 20+ brands) of natural skincare options until I found what worked optimally for me. On this page, you’ll find the two essential parts of holistic skincare for acne: addressing it from the inside-out and from the outside-in. Acne is a symptom of underlying problems in the body. When we slather benzol peroxide on our skin without asking “why am I breaking out?” we fail to hear what our body is trying to tell us. Symptoms are a sacred form of communication from our body’s deep intelligence, and should be questioned rather than silenced. 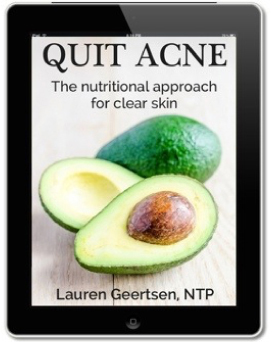 When I put together these pieces that were causing my acne, and identified the nutrition changes required for healing, I wrote Quit Acne: The Nutritional Approach to Clear Skin. It’s a must-read for anyone who wants to heal these root causes of acne. Through acne, your body has been asking you to change your diet. It’s time to listen. Very Helpful Book. I'm glad I downloaded this one - a quick read with easy to implement diet and vitamin info. I'll be trying out some of these tips from this book for my son. I love this book. I feel so much healthier after following the guidelines it gives. I've been recommending this book to all of my friends. It shows how some of the modern misconceptions about acne and diet/lifestyle are not exactly what they seem, and sometimes vastly different. Very enlightening. As I mentioned, I’ve countless skincare brands in an attempt to find products suitable for my sensitive skin. I hold extremely strict ingredient standards, and so most “natural” products don’t cut it. In my research and self-experimentation, I also developed a set of Holistic Skincare Rules that very few brands honor. Avoid harsh cleansers. A cleanser should be purifying but gentle, and not leave your skin with a squeaky-clean feeling. That indicates it strips away the skin’s protective oils. Befriend facial oils. If you struggle with oily skin, don’t avoid oil-based skincare. The right facial oil will bring balance to sebum production and heal acne marks. Know which products to DIY, and which ones to buy. I do make some of my own skincare products, such as simple lip balms or oil cleansers, but I invest in the products that I cannot effectively formulate at home. Avoid over exfoliation. The skin has a finite number of cell layers — when we scrub away too many layers, the skin can not regenerate. When I learned that, I immediately ditched my harsh scrubs and acid peels. Choose a safe SPF. Sun exposure does damage skin, but is also necessary for vitamin D synthesis. The balancing act is using a sunscreen to avoid sunburn. Most sunscreens on the market contain hormone-disrupting and potentially carcinogenic forms of SPF, such as oxybenzone, avobenzone, octisalate, and octocrylene. 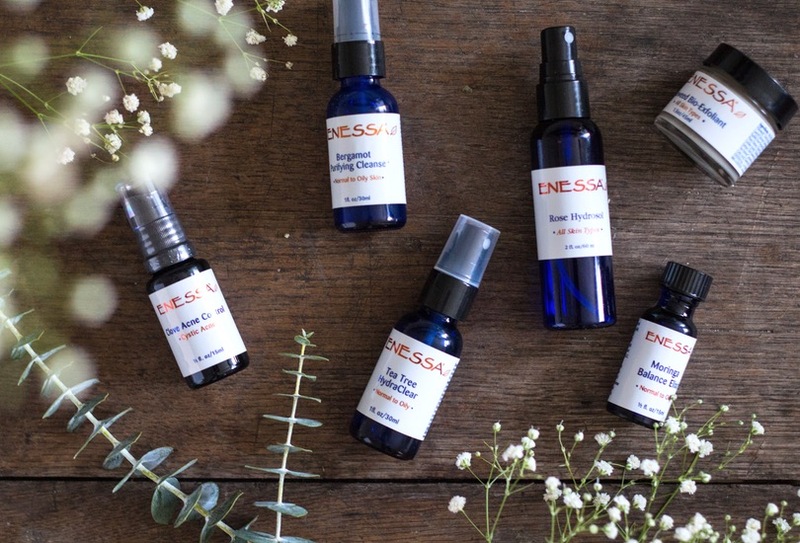 One of the most influential people in my journey to health skin is aromatherapist Michelle Ornstein, founder of Enessa Organic Skincare. Her extraordinarily pure, effective formulations use plant oils, essential oils, and plant extracts to address all skin concerns. When I changed my diet and lifestyle, my acne decreased by 70% within a few months. But I still had 30% of my acne problem, and these products cleared my skin almost completely. 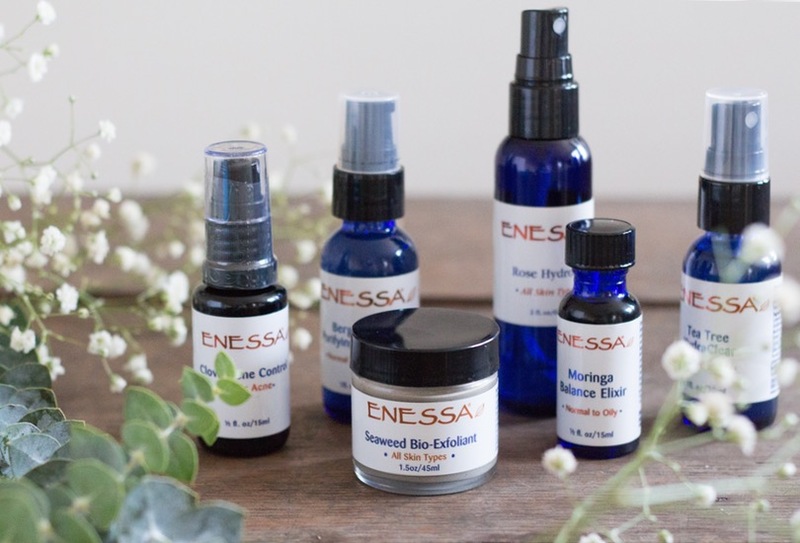 Enessa is the skincare brand I’ve used and recommend for four years now. I’ve had the privilege to learn about holistic skin care from Michelle, as we’ve collaborated on blog posts here. Most recently, I worked with her to create this Acne Kit, which contains introductory-sizes of my essential products at a discount price. Michelle made this kit available to you for 20% off for a price of $115. The Clove Acne Control is the best product I have ever used. I wish I had known about it before I went through several months of Accutane treatment -- this is better, with none of the side effects! I love the Seaweed Bio-Exfoliant and I use it twice a week. My skin is on the dry side and this scrub makes my skin feel very soft without stripping my skin and making it too dry.